When he took over the old stunt game show Truth or Consequences in 1956, Bob Barker was a handsome young hotshot replacing the balding veteran Jack Bailey. 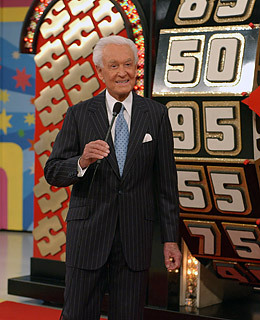 More than 50 years later (divided between T. or C. and The Price Is Right, the show from which he's finally about to retire), Barker never lost his utterly natural charm or self-effacing people skills. Quick-witted but never showy, mocking but never cruel, warm but never maudlin, Barker may have let his hair go white (with the network's approval), but he never aged.